Middle-aged smokers who grew up with mothers who had smoked heavily (more than 20 cigarettes per day) had a nearly three-fold greater risk of developing chronic obstructive pulmonary disease (COPD) than those with much less secondhand smoke exposure during childhood in a newly reported study. The population-based study -- the first to attempt to quantify the impact of maternal smoking during childhood on lung function later in life, the authors said -- showed heavy maternal smoking to be associated with post-bronchodilator airflow obstruction in middle age. This exposure was found to augment the effects of personal smoking, Jennifer Perret, PhD, of the University of Melbourne in Australia, and colleagues wrote online in the journal Respirology. "While the potential as a COPD risk factor for adult offspring has not been comprehensively documented, our study suggests that the early life exposure to maternal smoking may increase an individual's susceptibility to the harms of personal smoking in later life," the researchers wrote. "Identifying those most at risk might provide an opportunity for a more individualized approach to the prevention of COPD." The notion that early-life exposures may influence COPD risk is gaining acceptance, they noted. "Maternal smoking adversely affects the ventilatory function of offspring, including neonates, infants, children and adolescents," they wrote. "The idea that maternal smoking exposure might predispose to COPD in later life appears largely based on these pediatric studies, and of the few adult studies, only one examined pre-bronchodilator (BD) spirometry as a categorical outcome." Previous studies also have lacked information on the relationship between ventilatory function declines and impairment of gas exchange or lung mechanics. Using data from the fifth-decade follow-up of the Tasmanian Longitudinal Health Study, which includes close to 8,600 participants followed from their birth in 1961, the researchers were able to examine the impact of early life exposure to secondhand smoke on later life COPD. The ongoing investigation is the world's largest and longest running respiratory health research study. The analysis included 1,389 study participants who underwent pre-BD spirometry in 1968 at age 7, were surveyed during middle age, from 2002 to 2005, and participated in further surveys and testing, including pre-BD and post-BD spirometry, skin prick testing, static lung volumes, and gas transfer factor measurements. Mean age at lung function testing was 44.9 years and about half (51%) were men. Two-thirds (67%) reported ever having asthma, one-quarter had current asthma, and 43% were lifetime nonsmokers. At baseline, 38% of the subjects' mothers and 59% of fathers reported being current cigarette smokers, including 17% of mothers and 34% who reported smoking more than 20 cigarettes a day, defined as heavy smoking. 3.Maternal smoking per se approximately doubled the adverse effect of personal smoking on gas transfer factor (z-score -0.46, 95% CI-0.6 to -0.3] versus -0.25, 95% CI -0.4 to -0.1, P=0.048) but was paradoxically associated with reduced residual volumes for nonsmoking offspring Study limitations included the measurement of maternal smoking at a single time-point when the children were 7, which did not allow the researchers to assess the impact of in utero and very early childhood exposure, and the lack of data on cumulative maternal smoking exposure and air pollution exposure. The researchers noted that residual confounding was possible. The study participants were also almost exclusively of European ethnicity, so the generalizability of the findings is not known. And they noted that their primary outcome of spirometrically defined COPD "might not relate directly to the COPD phenotype that usually manifests clinically beyond mid-adult life." In an email exchange with MedPage Today, Perret noted that additional studies are both needed and warranted to clarify the long-term lung function consequences of early secondhand exposure to cigarette smoke. But she added that the findings of her study and others have immediate health implications. 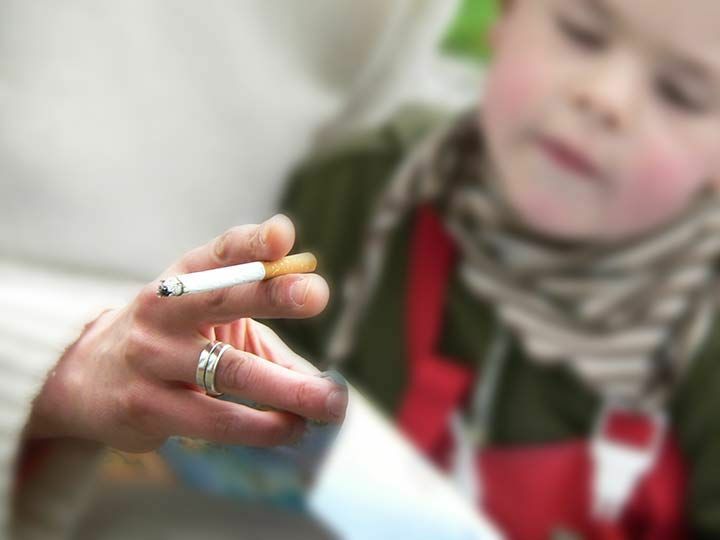 "This study provides further evidence for mother's smoking to influence the lung function in children when measured in middle-age," she noted, adding that they also reinforce public health messages warning pregnant women and mothers with children in the home not to smoke. Allergy and immunology specialist Richard F. Lockey, MD, of the University of South Florida in Tampa, agreed, noting that the link between secondhand smoke exposure and childhood asthma is well documented, and one of the strongest environmental exposures known. But he added that concluding that a mother's smoking contributes to COPD many decades later is a big leap. Lockey was not involved with the study, but he commented on the findings for MedPage Today. "I certainly would not add this to my conversation with patients about smoking until more rigorous research is done," he said. "All it would do would increase guilt and, maybe, increase smoking."